Detroit has 20 square miles of vacant land, which is a mass roughly the size of Manhattan, according to a report by Detroit Future City. One of the more important questions the city faces is what should be done with all that land. "Detroit must transform its image of vacancy into an image informed by the new possibilities for 21st century land uses," the report says. "This means creating new opportunities for vacant land to become assets that contribute tax dollars, produce jobs, or become a public amenity." Enterprising groups and visionary individuals who care about the future of Detroit or who see potential for economic benefit are at work transforming this space into urban farms, carbon buffers and solar power developments. 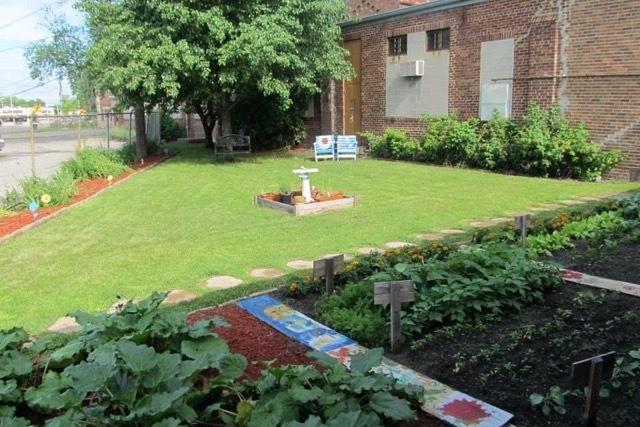 Other parcels of Detroit's vacant land are finding new life as outdoor educational facilities filled with native plants, neighborhood gardens where students can practice hands-on math and science skills while growing edible experiments, and landforms that filter rainwater and reduce flooding while giving high school students valuable lessons in green infrastructure. There's even a proposal for an urban equestrian center. We took a closer look at four projects in various stages of planning and completion that have the potential to impact the lives of the Detroiters who are positioned to affect long term change in the city: its youth. 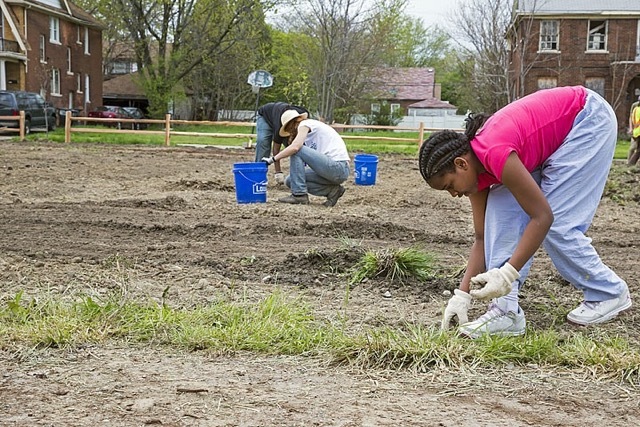 Identified for its proximity to a library and community center, and within walking distance from local schools, The Greening of Detroit and its partners selected Osborn for a three-quarter acre, community accessible native landscape. "We wanted a site we could design and install with the help of the kids, and pull in the community as part of the design process," says Dean Hay, director of green infrastructure with The Greening of Detroit. Through a partnership between American Forests, the Osborn Neighborhood Alliance, Bank of America, and The Greening of Detroit, the space—which combines a shortgrass prairie, a 40-foot gathering space, and a butterfly habitat—was installed over four days at a cost of $17,000. "It's amazing educational bang for the buck," says Hay. Utilizing two separate ecosystems, the Greening will offer 20 environmental education courses in the space next year. "That can be a community education session, or an age-group specific education session where we talk about the plant species diversity and the animals they attract, or storm water issues and how this little piece of nature is different from the overgrown lots that are a detriment to the environment," says Hay. "There's a clean spot in the neighborhood for the first time in 10 years," he continues. "We teach about sustainable landscapes and how their footprint can be different." The students also learn that they can have an impact on their environment, a notion often overlooked by adults. "They now have a role to advocate for and see a project from the beginning and see they can make a change on their own, which is huge." Adjacent to the Rouge River and in view of Cody High School, The Greening of Detroit worked with the 15- to 20-member "Green Team" at the Detroit Institute of Technology to construct a bioswale to counteract flooding in Stein Park. In addition to teaching earth science, helping his students learn to use their voice for change was a goal for Chad Segrist, former Cody STEAM coordinator and lead science teacher. "[The project] connected to what we wanted to accomplish," says Segrist. "We had determined the need because we had just gotten over a major flood. We talked about what it means to have a closed sewer system and the concept of eco-justice." His students jumped at the opportunity to work on this project. "The kids did some planting, some construction, and had a blast." They even presented about their experience at a My Brother's Keeper event in Lansing. "They wowed the room," says Segrist. "They showed the power that youth have in changing the look of their neighborhood and its perception through voice. That's powerful." Every day, first through fifth grade students from several schools gather for after school tutoring and summer programs in a dedicated St. Vincent and Sarah Fisher Center (SVSF) space. In 2011, the SVSF offered to help care for a plot of land located next to an alley; today they plant and tend two crops each year, with help from about 15 nutrition and dietetic students from Madonna University. "Something as simple as plotting the garden uses math skills," says SVSF Center CEO Diane Renaud. "Even the younger kids can participate. More complex issues are taught by Madonna students to the fourth and fifth graders, who mentor the younger kids." Students learn about nutrition and food growth cycles, as well as gain insight into college student life, according to Laura Kull, director of the Didactic Program in Dietetics at Madonna University. She says her students benefit as much as the little ones. "[The experience] teaches my students about community engagement and service learning, about not solving a problem, but doing your little piece to increase the capacity of the program as much as you can," Kull says, noting that some of her students have been forbidden by their parents to enter the city of Detroit. "They learn they can take a little step now, and then go a little deeper." The beautified space has a positive impact on the neighborhood, as it's fully visible to nearby retail space. "[The owners] say it is inspiring to see kids out, laughing and engaged. They say it makes them feel like this area is going to come back," says Renaud, adding that local owners now work harder to clean up their own spaces. "We are creating a little oasis off of Grand River." Vacant land plus inner city kids plus horses equals self-confidence, resilience, and empathy. That's the thought behind Detroit Horse Power (DHP), a nonprofit launched through small private donations and grants in 2015 with the tandem goals of repurposing vacant land and providing growth opportunities for youth. But there's work to be done before kids can ride horses within city limits—a law currently on the books prohibits livestock. DHP founder and executive director David Silver says there's momentum for a new urban livestock ordinance to allow for smaller animals, such as chicken, ducks, goats, rabbits, and honeybees to be kept in backyards. "A related provision would have an 'other' category, with larger animals approved on a case-by-case basis," says Silver. "For the right fit, this will be where we can keep healthy and happy horses and be good neighbors who want us in their community. It's a unique chance to add something special to the future." Silver adds that officials are open to alternative uses for vacant and blighted land. "Our proposal is for a site that is 15 to 20 acres, a large contiguous area, in a community that wants horses to be part of a neighborhood's future." With six potential sites of interest, DHP will use a $7,500 mini-grant awarded by the Community Foundation for Southeast Michigan to analyze the sites and work with community members to catapult facility development. 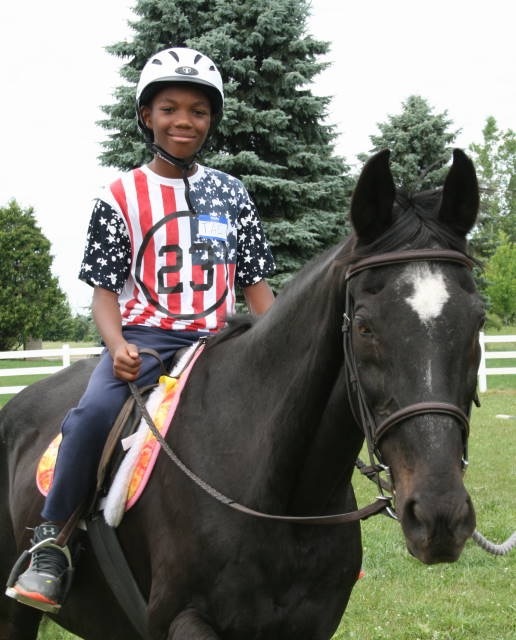 In 2016, DHP ran six-week long summer camps outside the city, providing equestrian experiences to 91 students from Burns Elementary School, Denby High School and Alternatives for Girls, Downtown Boxing Gym, Summer in the City, and Friends of Parkside. Participants learned riding and horse care, and listened to guest speakers talk about equestrian professions. "But the most important lessons were about the self … a self-belief in the saddle that we translate to tackling difficult academic material in the classroom, and an empathy for horses that makes us caring citizens and grow the patience to solve problems without violence," Silver says. "Our impact will be significantly multiplied when we can make this accessible in the city limits and do it at our own facility, turning the burden of vacant land into a community asset for valuable skills and driving growth in our city's neighborhoods." Photos of Osborn Outdoor Education Center by Jim West.